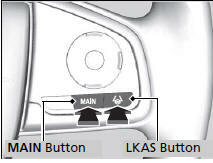 To cancel the LKAS: Press the MAIN or LKAS button. The LKAS is turned off every time you stop the engine, even if you turned it on the last time you drove the vehicle. Pressing the MAIN button also turns ACC with LSF on and off. Set the wipers to continuous operation. ► Turning the wipers off resumes the LKAS. Set the wiper switch to AUTO and the wipers operate continuously. ► The LKAS resumes when the wipers stop or operate intermittently. Decrease the vehicle speed to 40 mph (64 km/h) or less. ► Increasing the vehicle speed to 45 mph (72 km/h) or more resumes the LKAS. 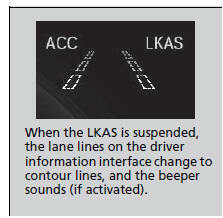 ► The LKAS resumes and starts detecting the lane lines again once you release the brake pedal. The system fails to detect lane lines. The steering wheel is quickly turned. You fail to steer the vehicle. The vehicle runs on a curved road over the speed limit. Once these conditions no longer exist, the LKAS automatically resumes. The camera temperature gets extremely high or low. The camera behind the rearview mirror, or the area around the camera, including the windshield, gets dirty. When driving through a sharp curve. When driving at a speed in excess of approximately 90 mph (145 km/h). When the ABS or VSA systems engage. A beeper sounds if the LKAS is automatically canceled.